Worst Assassins Ever (The Non-Blogathon!) #1: The French Connection | "DESTROY ALL FANBOYS!" IF yours truly was ever going to host a blogathon, it would either be something like the ‘That’s NOT My City!’ or ‘Worst Assassins EVER!’ blogathon because both are topics that make me chuckle in films more than they’re supposed to. As a native New Yorker who’s heard from a bunch of friends over the decades about how certain films shot here (or places pretending to be here) range from inspiring (great!) to “It’s so unsafe there! Do you actually go out at night?” (lousy! ), I can think of far too many made in (or outside) in NYC films to scribble about. As for terrible assassins in films, with assistance I could probably write a book on how the best of the best go from first in their class to dirt-napping klutzes thanks to inconvenient plot monkey wrenches needing them to forget how good they are in favor of making a series of increasingly terrible decisions that put them into the hall of shamefully comedic demises. However, between being a bit more scattered than usual (“I want the hangings public” is my mantra of late) and not motivated enough to create all those GIFs, promo posters and banner art to pass out to potential contributors, I’ve decided to flip a coin for the name and non-host a stealth blogathon anyone can contribute to. Or not. Actually, this particular film popped into my head first because it fits both categories perfectly AND happens to be a great essential flick that’s still well worth a look. For those about to complain… don’t. I love this film to death, but repeated viewings over a few decades show it’s got a hidden comic gold vein running through it in the form of one the the most inept professional killers you’ll ever see. Now, if you’re seeing this film for the first time, it’s easy (very!) to get caught up in the sheer dynamism on display. Friedkin’s direction, Gerald Greenberg’s tight editing, the assorted actors doing their thing, all that stuff works FINE. However, the assassination attempt scene is so implausibly dumb that it almost derails the film entirely. Instead of hanging out in the hallway waiting for his target as he strolls up to his front door, blasting him in the face and breaking off a piece of cold New York City pizza (Hey, I live in New York City…), Nicoli waits on the roof of Doyle’s apartment building with a sniper rifle, shoots and kills an innocent bystander near the detective, misses his target again but manages to escape using the dumbest possible means of escaping an attempted killing of a police detective. Okay, not knowing of this city’s notorious train delays is kind of acceptable… but still, it’s a bad getaway plan in general. Worse, Doyle take the stairs up to the roof AND back down (he’s shown running up to the roof, so we’ll assume he ran back down), yet has time to spot and chase Nicoli into that nearby train station. Somehow, he still ends up the wrong platform (with NO ONE ON IT!) as his would-be killer catches the next train out, which leads our hero to commandeer some poor guy’s car and proceed to wreck it during that thrilling chase. I actually noticed this the first time I saw the film and it never bugged me for years until a friend I’d recommended the film to rung me up during the car chase with many questions. You could hear his raised eyebrow coming at me with the “Okaaaay… this movie makes no sense!” stuff. I pleaded my Hollywood ignorance, of course. Speaking of Hollywood ignorance, the chase in this film IS phenomenal, but if you want to really see some vehicular mayhem that surpasses it, a little Remy Julienne goes a longer way. Vive la France! Uh, where was I? Oh, right. The funniest thing about Nicoli’s abrupt transformation from trained hit man to trained dead man is he’s erased from the film and forgotten despite leaving an innocent victim bleeding out on the pavement and a few more on that runaway train (that particular plot point being another implausibility). But Pierre! You started so strong, no? It’s as if the cross-continental flight sapped his skills… or was it just some really bad jet lag? Eh, I’ll leave that for you guys and gals to figure out. Hopefully I didn’t spoil the movie for those who haven’t seen it yet. If you’re mad enough to send an assassin, though… beware. Failure rate runs higher than usual if you go by Hollywood standards. 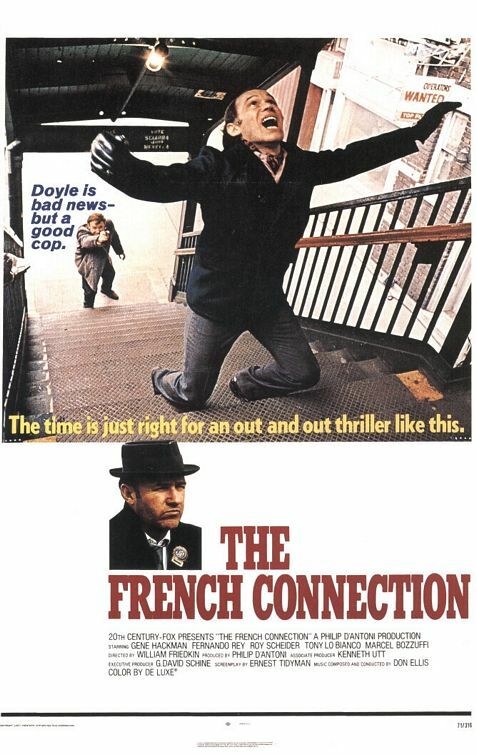 This entry was posted in Commentary, DAF, Features, Humor, Movie Posters, Updates and tagged 1972, 2017, 20th Century Fox, Classic Films, Movie Clips, Movie Trailers, MovieClips, Non-Blogathons, Random Films, The French Connection, Violence Is A Very Horrible Thing, YouTube by geelw. Bookmark the permalink.